The North Dakota DOT TAMP is available here. The North Dakota Department of Transportation’s Transportation Asset Management Plan (TAMP) covers several asset classes. 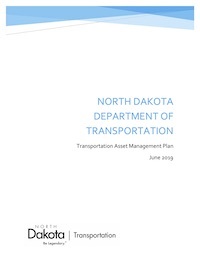 The TAMP describes the transportation system managed by the NDDOT, the method of managing transportation assets throughout their life cycles, the financial constraints in managing the system, the current performance targets for each asset class, and an improvement plan for the process of managing these assets. This document includes the following sections: Asset Valuation, Data Management, Financial Plan, Introduction, Inventory and Condition, Investment Strategies, Lifecycle Management, Performance Assessment, Process Improvements, Risk Management. The asset scope of this document is: Equipment - Maintenance, Facilities - Maintenance, Highway Assets, Includes other highway assets.